With cooking pot in Presto® Electric Pressure Cooker Plus, select BROWN to preheat cooker. Add oil; brown ribs on 2 sides. Press CANCEL. Whisk ketchup, rice vinegar, green onions, soy sauce, sesame oil, ginger, fish sauce, garlic, brown sugar, sesame seeds, red pepper flakes, and black pepper in a bowl until mixed. Pour water and half of the sauce over the ribs in the cooking pot. Close cover. Place quick pressure release valve on vent pipe. Select MEAT-CHOP/RIB and cook for 25 minutes. When time is up, allow pressure to drop of its own accord. Remove ribs to a baking sheet. Brush ribs generously with reserved sauce. 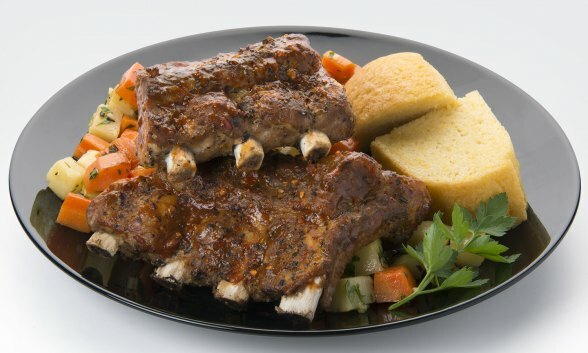 Place ribs under broiler for approximately 3 minutes or until lightly browned. Short ribs can be used in place of spare ribs. For short ribs, select MEAT-CHOP/RIB and adjust time to 30 minutes.